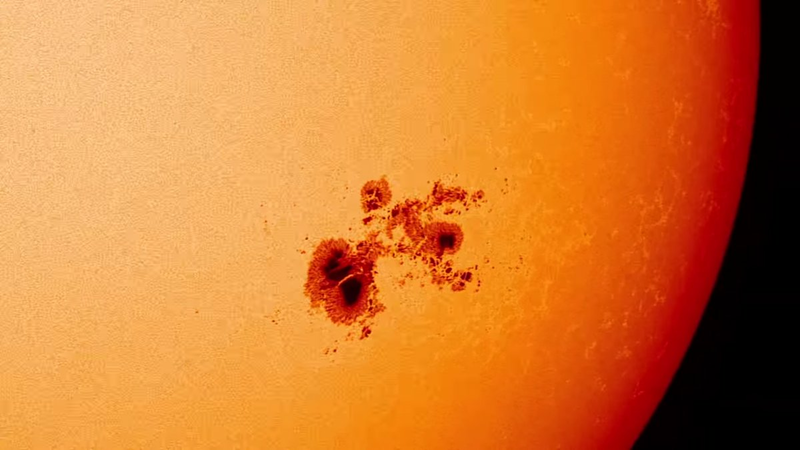 If you go back to the first image, what you're are looking at are two giant sunspots in blue and yellow. Both are huge enough to entirely swallow the Earth. 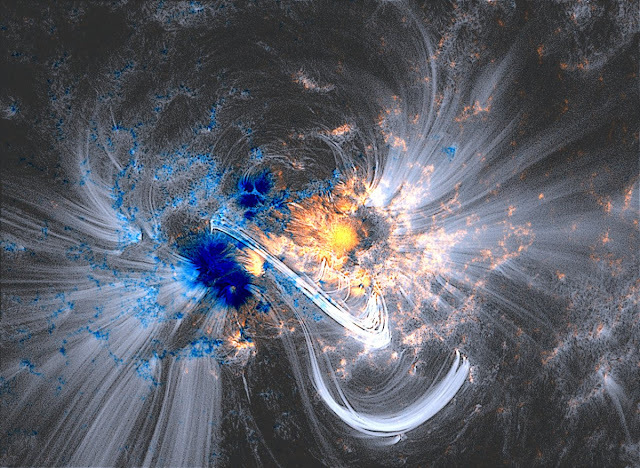 The blue and yellow are false colors — in actuality, the sunspots seem black on the solar surface. But these false colors assist with a significant purpose: The magnetic field of the sunspot in blue has a reverse charge from the sunspot in yellow. What's happening here is related to what take place when you throw some of iron filings onto a bar magnet. The bar magnet has a North and South Pole that produces magnetic field lines around it. These fields are entirely undetectable to the naked eye, but when you throw some iron filings around it, they essentially then outline the fields so you can see them. The super-hot gas discharging from the solar surface does the similar thing: It traces the enormously powerful magnetic field lines linking the sunspot that acts like the north pole of a bar magnet with the sunspot that signifies that south pole. The most spectacular part of this fresh SDO image are the white, ethereal curls — called coronal loops — flashing across the solar surface. These pale whiskers signify hot gas outlining the magnetic field lines linking the two sunspots. Though sunspots were initially studied in the 16th century by Galileo Galilei — the first scientist to see the universe through a telescope — scientists are still uncertain how these pockets of powerful magnetic activity produce sunspots. But with SDO and its more than 100 million images taken over the last five years, researchers are hopeful that they will disclose the mysterious procedure behind these mysterious spots.